This week's FOMC event may prove to be slightly more difficult for Chair Yellen to navigate as the division with the FOMC over the appropriate near-term policy approach grows.It will be interesting to see how she manages the two emerging camps – i.e. those members looking for a continuation of the current normalisation cycle and those looking for an extended (or even permanent) pause in hikes until there is more confidence in the US inflation outlook. 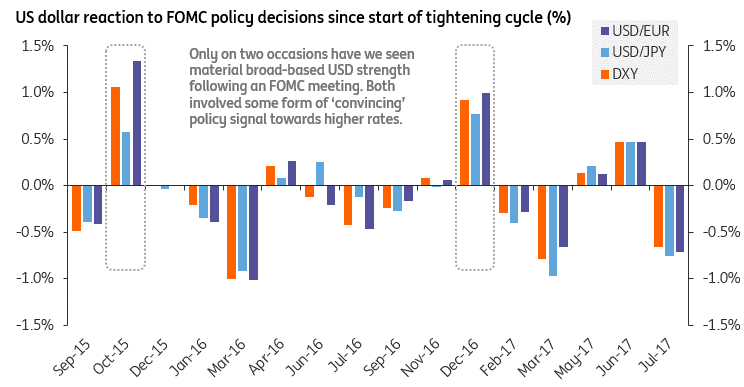 The balance of risks suggests there is more evidence for the dovish camp within the FOMC. The short-run disruptive effects of Hurricane Harvey (and potentially Irma), North Korea-related geopolitical tensions and lacklustre US inflation dynamics mean that we are likely to see the Fed's dot plot reflect a lower conviction over the pace and extent of future policy tightening. While the median 2017 dot is still set to tentatively pencil in a December rate hike, we expect to see more members calling for a pause for the remainder of the year. Anything more than five would suggest the likelihood of additional tightening this year hangs in the balance – with markets right to price in 50:50 odds. More telling of a dovish shift would be if the 2018 dot also moves lower. Here we require five or more members to downgrade their views over future policy hikes – a scenario that cannot be ruled out given the softer US inflation dynamics. 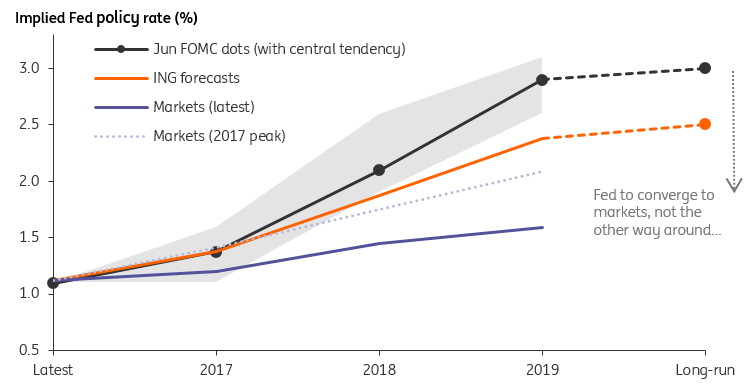 It's certainly more likely we'll see the 2019 and longer-run dots moving lower – with Fed officials acknowledging that a 2% handle on the terminal Fed funds rate is more realistic in the current economic environment. We'll also see the introduction of the 2020 dot this month, and we expect this to be in line with the longer-run dot, thereby putting an explicit end-date on the current Fed's hiking cycle. While we do not expect US yields or the USD to move much on what would be a well-telegraphed balance sheet announcement this week, there is a non-trivial risk of the Fed delaying this process. One of the pre-conditions Chair Yellen had stipulated back in March was the need for solid underlying momentum in the US economy, and recent weather-related disruptions may give officials a reason to hold fire. This would indicate the Fed's more pessimistic view of the US economy, and we expect this tail risk scenario to be an outright negative for the US dollar - more so through the signalling channel, rather than any substantial move lower in US yields. The July FOMC minutes also pointed to two members expressing contrasting views on another major issue: the interpretation of easier financial conditions and what the appropriate policy response should be. Though one member noted that easier financial conditions might warrant tighter monetary policy (the conventional wisdom), another floated the more avant-garde view that elevated risky asset prices were a response to markets adjusting to structurally lower neutral interest rates - a factor which the Fed cannot control. This implies that in the absence of inflation, there may be little need for additional Fed rate hikes to tighten financial conditions. We tend to agree, particularly since broader US financial conditions are now clearly becoming less responsive to adjustments in the short-term policy rate. This may well be the same conclusion that Yellen articulates in the press briefing this week, which on its own shouldn't prompt any major re-pricing of Fed policy expectations. Chair Yellen’s future is also likely to come up in the press briefing, especially after Vice-Chair Fischer's earlier-than-scheduled resignation announcement. We think uncertainty over the Fed's future leadership, as well as the broader policy framework, maybe keeping front-end US rates flat - with investors sceptical about making wholesale changes to Fed policy assumptions, until there is greater clarity. The most market-friendly outcome at this stage is if Chair Yellen stays on beyond her term scheduled to expire in February 2018 - even if it is a temporary arrangement. Typically, it is difficult for the dollar to rally on Fed meetings and this time may not be any different. Hawkish Fed cries could fall on deaf ears again given the lack of convincing economic evidence. Fading the USD corrective rally may be a wise tactic ahead of the Fed meeting. We fear markets could still shift to the idea that any 'pause' in the Fed’s tightening cycle will be somewhat lengthy (if not permanent) and the risks are that the recent front-end flattening of the US yield curve has further to run. 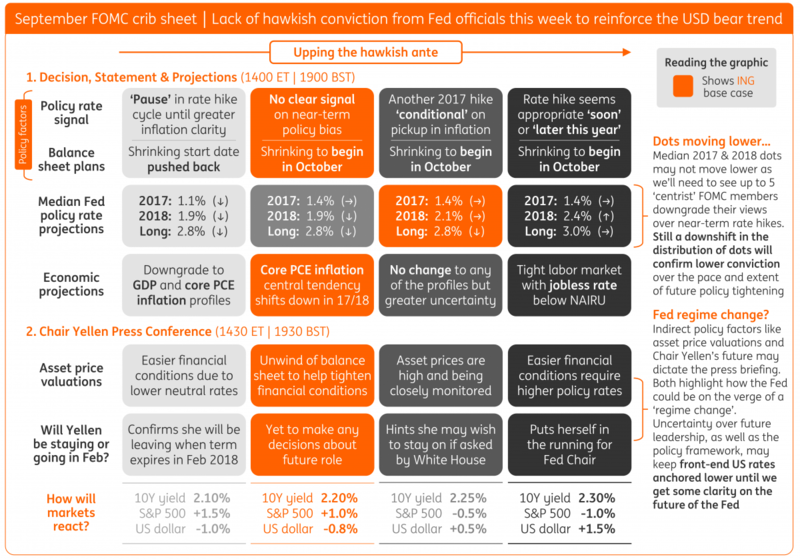 In the absence of any convincing hawkish signal -such as a reference to another rate hike being 'appropriate soon' - we think the USD is likely to follow the historical pattern of moving lower in the aftermath of the FOMC meeting.